Every so often I tell my husband that he is my rainbow unicorn snowflake. It's my way of telling him how very special I think he is. His usual response doesn't fit the G rating of this blog. 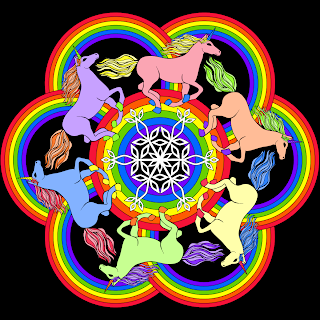 Anyway, here is a rainbow unicorn snowflake mandala. For people who really love unicorns, rainbows and snowflakes. Color it in or embroider it. I just want to tell you how truly kind & generous you are, sharing all these awesome things with your readers. THANK YOU! I love coming over to see what you've posted, and I love MAKING some of the delightful boxes & other projects you've allowed us to have. Sending you smiles & hugs because you are TOTALLY nice! LOL! loved that tidbit from your life! and I love this mandala. thank you!!!! !